I love walking through my garden several times a day. The Spring bulbs I planted in Autumn are beginning to bloom. 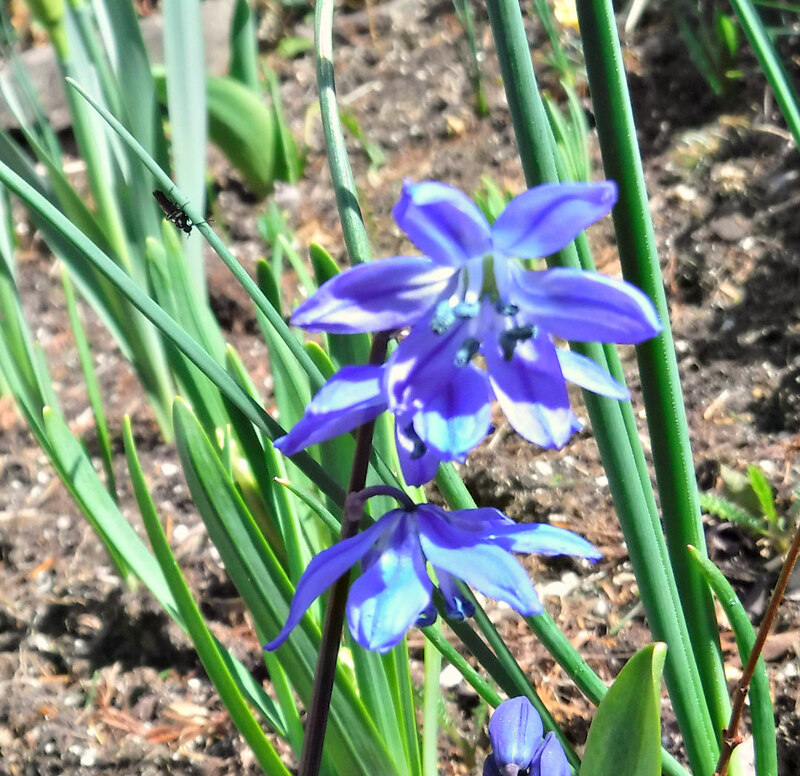 This beautiful scilla, captured a bit of the blue sky in it’s blossoms. I decided it was pretty enough to be part of Cee’s Flower of the Day. I had a surprise when I downloaded the photograph and spied a small insect of some type on the underside of the the Scilla leaf. Do you see it to the left of the uppermost bloom? It appears to be a sweat bee, ready to begin searching for pollen and nectar. Why would this thrill me? I felt like it was sent from God to give my spirit a lift. You see, when I paint a floral watercolor, I always include a small inchworm somewhere in my painting. The sweat bee felt like God calling my attention to his artwork, and reminding me to stop all the never-ending upkeep of house and garden, and nurture myself a bit and paint. This post is part of Nurturing Thursday. That blue is a heavenly blue. What a lovely thought! Enjoyed your post today! I love the way you think. My friend, DiVoran would agree with you! Thanks so much, and thanks for stopping by today. The sweat bee was definitely a call to stop and enjoy life! We need to stop from time to time to see the nurturing signs in our lives. Yes, we do…it gives me strength to see something beautiful in nature.